Fancy something a little different? Try these soft tacos filled with spicy prawns and squid. Very easy to make and fantastic for sharing - give them a go! 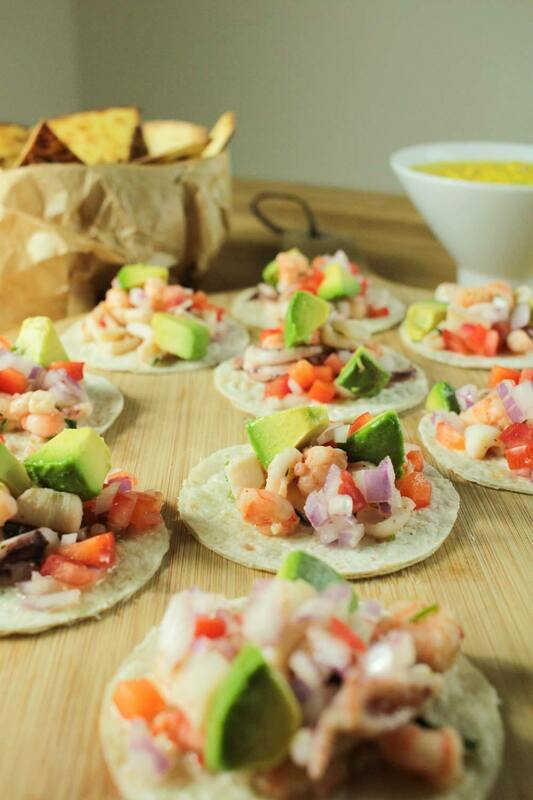 To make mini tacos, use your tortillas and cut them with cake cutter or something round using a sharp knife. Put them in the microwave for 30 seconds to heat through. Finely cut up the red pepper, red onion and tomato and squeeze a little bit of lime and mix together. Slice the avocado into small chunks in separate dish and add a squeeze of lime juice. Set these aside while you cook your filling. Add a small amount of olive oil to a frying pan and add the chilli. Cook for about 30 seconds and add the prawns, stir to combine. Add the chopped garlic followed by the squid and cook for a minute or two until cooked. Add the coriander and lime then mix everything together. To each taco add a small amount of filling followed with a sprinkle of the onion, pepper and tomato then finish with a few chunks of avocado.